The image: In the run-up to November's election, staff members working for Rep. David Wu (D-Ore.) expressed growing concern that their boss was mentally unstable, the Portland Oregonian reported last week. Wu's worrisome antics, which included "loud and angry behavior," saying "kooky things to staffers," and lambasting his opponent as being "stingy with tips," led Wu's staff to keep him away from the public for three days before the election, and to make inquiries at nearby psychiatric clinics. 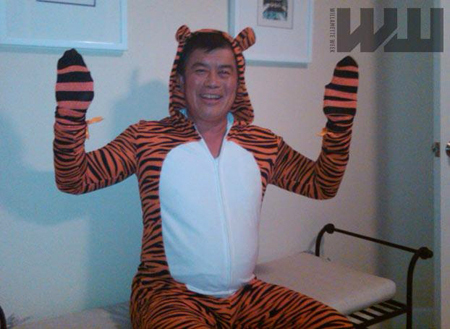 Wu also sent a series of strange middle-of-the-night e-mails, including a "bizarre" one in which the congressman posed in a tiger suit (see below). After Wu won a seventh term in the House, six staffers, including his chief of staff and campaign pollster, resigned.